The sewer mainlines were cracked and offset from years of “bucketing” (cleaning the sewer with a bucket machine). Inactive drain connections from when the combined sewer was separated into storm and sanitary in the 1950s were a significant source of inflow and infiltration (I&I). The live drain connections were overgrown with roots, with some connections 100-percent blocked. Homeowners were in jeopardy of sewer backups, and the city’s infrastructure and treatment plants were under significant stress. Remediation by conventional open-cut means posed several challenges. There were over 300 metres of 600-mm storm mainline skirting the curb on residents’ front lawns, and another 320 metres of sanitary mainline running directly down the centre of the road. To dig and replace these lines would have inconvenienced homeowners along the entire street by limiting access to driveways. Both sewer mainlines also ran into, or across, an arterial road - Wyandotte Street East. Closing this roadway would mean lengthy delays for motorists and further disruption to homeowners in the vicinity. 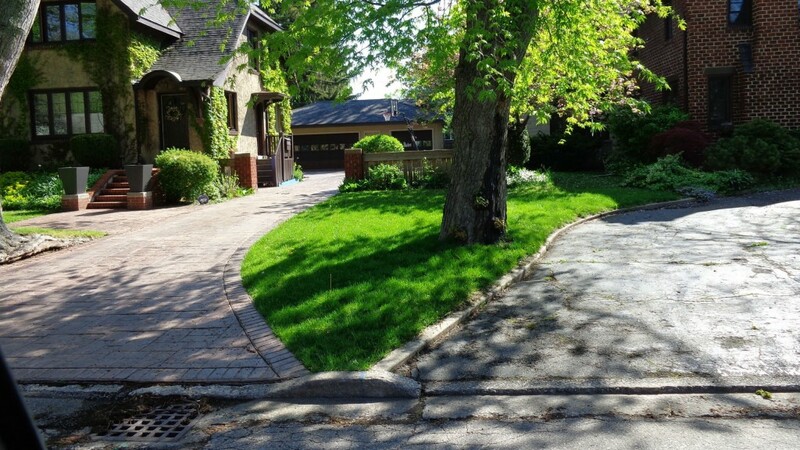 “We had used trenchless technology three times in the past and we decided this would be a good candidate for us to get in and rehabilitate everything to the property lines from the mainline,” said Ian Day, supervisor of field services for the City of Windsor. He noted that the city had done some sanitary sewer lining previously, but this was the first time it considered lining both storm and sanitary sewer lines from the main. In Windsor the lateral connections are private, meaning the rehab could only go as far as the property lines. In the fall of 2015 LiquiForce was contracted by the City of Windsor to rehabilitate Eastlawn’s aging infrastructure using its “Gravity” system, which allows the rehabilitation of private drain connections and city mainlines without having to dig up existing assets. According to Day, the Gravity system worked well for Eastlawn considering the limitations on accessing the privately-owned laterals. The photo on the left shows the pipe with root infiltation, and the one on the right was taken after lining. Next, LiquiForce assessed the private drain connections via specialized camera equipment. Disconnected or “dead” connections were identified by using dye tablets or by the presence of a cap at the end of the line. In total, 80 connections were inspected with only 59 of them being active. Armed with measurements and connection information in hand, seven separate one-piece CIPP liners were installed, one in each mainline section. Active connections were reopened via robotic cutter, and inactive services were sealed, preventing further I&I. This step rid the existing infrastructure of 21 large 150-mm holes in which roots and infiltration would easily find. “There were some collateral problems with the roots infiltrating through the laterals, but we figured by taking it to the prop erty line we cleared most of the trees and that should alleviate our problem,” said Day. With mainlines now rehabilitated, LiquiForce sent in its proprietary lateral prep equipment. This equipment allows the same preparation needed on mainline sewers to be conducted in the much smaller and more difficult to access private drain connections. Water-powered equipment cleaned each home’s lateral with no service disruption. Finally, LiquiForce’s lateral lining team installed liners in each of the 59 active services. These liners are a one-piece monolithic construction with a patented hydrophilic seal at the main. This process, as with all of the processes before, only requires access from the manholes within the roadway for a short time. The result of the $670,000 program was about 650 metres of mainline sewer and just over 250 metres of lateral lining completed within 50 working days. Every storm and sanitary connection within the block has been sealed of infiltration and root intrusion. The entire length of both sanitary and storm mainline sewers has been sealed of infiltration and root intrusion, including both sections running across Wyandotte Street East. The concerns that residents voiced over having to fight with roots on a yearly basis for fear of their sewer systems backing up have been alleviated, along with the excess stress on the city’s sewer treatment plant. And, all of the above was accomplished without digging, with a small footprint, and, for the most part, while homeowners were at work Monday through Friday. According to LiquiForce, its Gravity program is the only program to seal from the homeowner’s side, to the mainline, through the manholes and to the treatment plant without digging. This year LiquiForce has been contracted to seal eight manholes on 2015’s Eastlawn Street project. Through LiquiForce’s SpectraShield trenchless manhole lining system, all manhole structures will be sealed of any infiltration as well as against sewer effluent harmful to most concrete. The Junction Liner used on Eastlawn repairs and that connects the mainline to the lateral. This system repairs “hammer taps” and the hydrophilic seal ensures the connection is leak-free. This is done without affecting the flow of sewage in the main.